Maisie and I had a go at making 'white soda bread with duileasc' from Irish Seaweed Kitchen by Prannie Rhatigan recently. Duileasc is the Irish for dulse, a seaweed commonly found in Irish coastal waters. According to Prannie this is a seaweed that has been eaten in Ireland since 3200 BC! It also has the distinction of being mentioned in the Brehon Laws, a set of laws governing Ireland that was written in the 5th century. You won't find a better accompaniment to roast fowl seemingly! 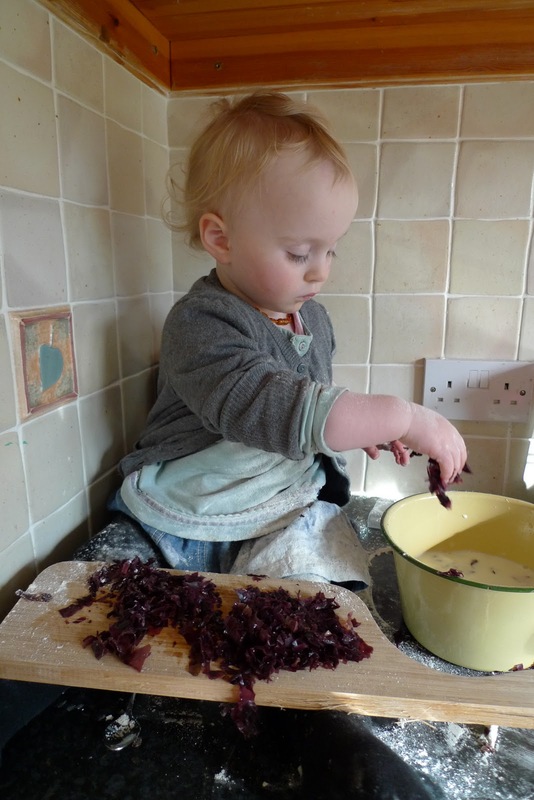 If you have a little helper in the kitchen first get her to mix the dry ingredients. After a gentle mix, needed because the recipe uses spelt flour, pop in in the oven and 45 minutes later you have one very big and totally yummy seaweed soda bread! It looks and tastes soooooo good. Really hearty. We ate it with curried red lentil, chickpea and red kale soup. I have never heard of seaweed bread before. It must be powerfully healthy for you. I'm so happy you enjoyed it with my soup. I love that curried red lentil soup. Would love to taste that bread!